Digit - sucking habits include thumb, finger sucking and pacifier all are considered a non-nutritive sucking habit. Many changes take place in the mouth with digit sucking. Unnatural high narrow arch is forming from pressure of the digit or digits. Pacifiers - can be a blessing and a negative. According to research pacifiers in today's world reduces the risk of SIDS. Hospitals provide pacifiers for infants for soothing and comfort. The negative is when the child starts getting their deciduous teeth (baby teeth. Pacifier use can cause dental concerns. Developmental issues that can then cause speech, or tongue thrust or reverse swallow. Which can lead to wanting only soft foods. Out of sigh out of mind for many. Moderation to elimination is the goal. At the age of 2 - reduce the use of blankets, teddy bears. Phasing it out for good is beneficial before orofacial myofunctional therapy. Infections in the nail bed or oral cavity can move to your gums and throat. 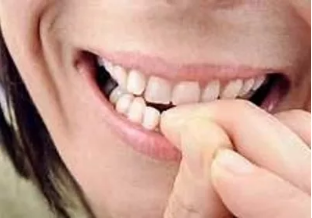 Chewing on your nails affect the edges of your teeth. Transportation of germs is instantaneous. Pus can develop - it's not a pretty picture for anyone. This habit can be one of anxiety - this is what someone might do as trying to hide they issues. Anxiety/nailbiting. This habit can be a hazard of physical and physiological health. We work with anyone who has this habit to eliminate and feel good about it. Several environmental effects of Oral Habits occur dental, TMJ and or skeletal alteration, speech impairment, medical implication, infection or distortion of digit. Dental Harm - Malocclusion includes crossbite, molding of the dental arches & palate, reshaping of the mandible/lower jaw. reshaping of condyles, alteration of lip and muscle function. Head or neck postural/mandibular functional changes possible speech concerns. Malocclusion can cause open mouth breathing which can cause possible health concerns. Lack of oxygen to the brain. Lip sucking can cause distortion of the tissue around the mouth. Thumb or finger sucking causes a high vault, narrow sinus cavity. This can cause sinus concerns in the future. These habits need to be corrected early in life for a healthy life. Oral habits can cause illnesses, child or adult. Putting anything in our mouths put us at risk for disease, viruses, or infection. Please contact us for more information on how we can help you eliminate oral habits.